The Osaka Motor Show begins this Saturday and, on top of an update to the Honda CB1100 standard-retro, we hear Big Red has two more concepts coming that will tug on the heart strings of off-road lovers everywhere. I thought I was getting a sense of deja vu, until I dig a little and realized I wrote this story literally almost one year ago today. 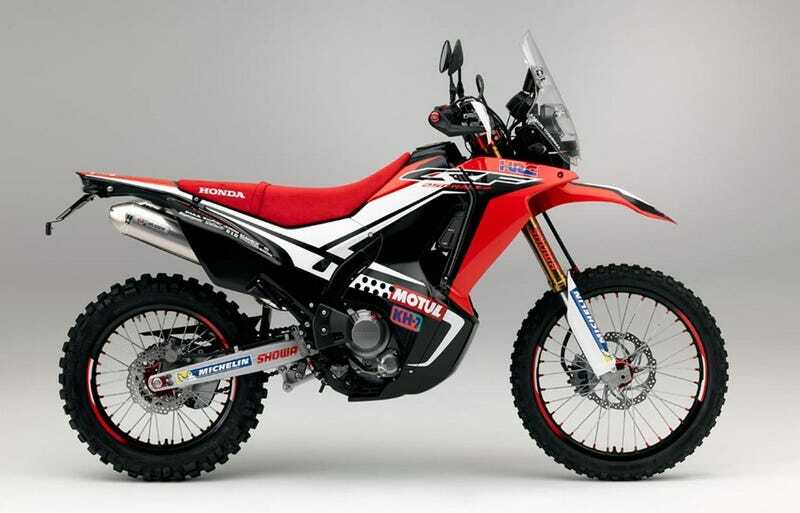 Despite this being the second year they’ll be showing it, Honda is once again bringing the CRF250 Rally to the Tokyo Motor Show. And, once again, it’s given me some deeply intense moto-feelings. Internet rumblings claim there’s actually a good chance we’ll see this bike as a production model this year, and I’m dumb and wishful thinking enough to believe them because this bike shouldn’t be too hard to make happen. And because they’re calling it a “prototype,” in typical Honda fashion, instead of a “concept” this time around. And because I deserve it. Now if only they’d put a little bigger motor in it. If only Honda had brought a Dakar version to when I rode the bike in South Africa... Photo by Sean MacDonald. Like the CRF250 Rally above, which is literally nothing more than a CRF250L dual sport wrapped in the CRF450 Rally racebike’s clothing, a Dakar style Africa Twin will likely be nothing more than different body work. I don’t care. I love all things Dakar, so this sounds perfect. Any guesses as to what they might add or anyone want to take a crack at a mockup? It isn’t like the Africa Twin doesn’t have adequate wind protection or luggage options. Maybe a bigger tank? I doubt it really needs a roll chart.